The parade is also a lot of fun. The kids are adorable and a lot of the parents dress up. The beginning of the parade as it heads from the park to the neighborhood. The parade ends on a block that has a party where everyone gathers and there are tables of goodies set up for the children and the adults. After the parade is over we head out trick or treating. A block behind our house is a place that sets up a huge haunted house every year. So many people go to it that there is always a long line and the police block off two blocks of the street. This year was especially fun because two woman dressed up like zombies and danced with the kids to Thriller. Zombies and Kids Dancing to Thriller in West Philly. 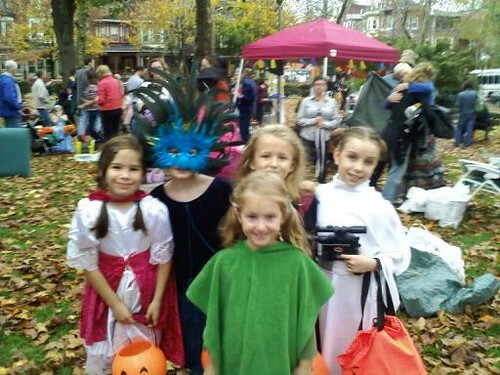 It was very warm on Halloween and it rained off and on but we had SO much fun. It was the most fun I had on Halloween in a long time. How about you? How was your Halloween? Did you dress up? These are really cool pictures and videos. Looks like a lot of fun! 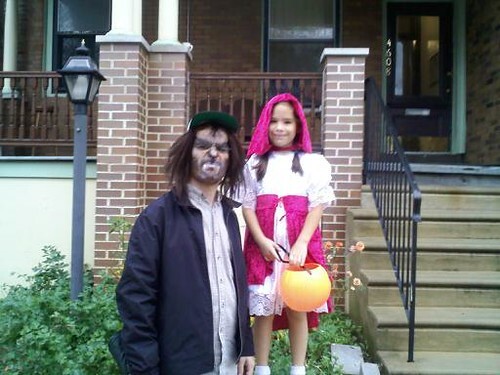 Hi Jim – I love Halloween but this was the most fun I’ve had celebrating it in a long time. Alex and I going to learn the steps to Thriller and perform it next year. Since I’m so uncoordinated, I’ll have to start practicing now. These are great pictures. Kids look so cute in these costumes. My son was optimus prime and he had a blast this halloween. .-= Ravi Kuwadia´s last blog ..Never Give Up Even When Goals Fail? =-. Some of the kids used to go to the mall to T or T…but the mall closed at 6pm???? Several schools had parties and the middle school had a dance. .-= Patricia´s last blog ..Grace =-. are never home. We live on the 3rd floor thought so we would need to sit on the porch – no one would ring our doorbell. so remote that only a handful of friends would stop by. that more than actually collecting candy. .-= Dennis Edell´s last blog ..Only 4 Ad Spots Left – Meet The First Advertiser! And The Pot Just Got Sweeter. ;) =-. Hi Dennis – LOL. Our porch light doesn’t work very well so the house isn’t very welcoming anyway. 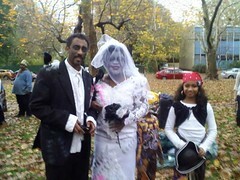 Halloween in Philly?, Whow, how I miss that. I used to live in Wilmington, Delaware, and I will always be in Philly for the weekends all the time. I also never missed the parades along South Street. Remember the Greek festival? The pics are not showing up on my side!! Sorry Kim I can see the pics clearly now, my DSL was playing on me. 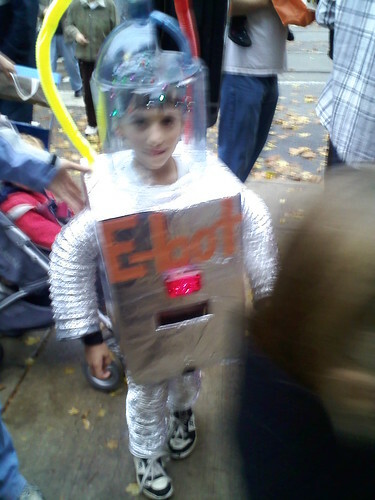 Lol look at that E-bot kid, thats kinda scary, I hope he does not suffocate in that Helmet. Nice pics, it looks like the kids had fun in West Philadelphia, the home of Will Smith. Man this does bring memories. Thanks again Kim for posting this. .-= Chebu @ Ladybug Costumes´s last blog ..Infant Ladybug Costumes =-. Hi Chebu – The front part of the e-bot’s mask thing was cut out – when I first saw him I didn’t think it was either.